My brother Christoph and I are both archaeologists at the State Office for Monumental Preservation at Stuttgart Regional Council (Landesamt für Denkmalpflege im Regierungspräsidium Stuttgart). We have been working in the archaeology section for some years now, and are primarily responsible for 3D documentation, aerial surveys, surveys using metal probes, geomagnetism, and database development. 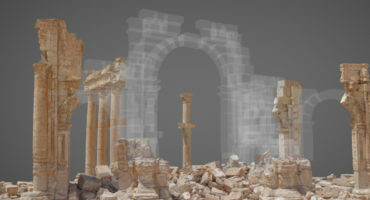 Our main task is to document archaeological monuments, findings and artifacts found during archaeological excavations in three-dimensional format and to work up the results in the form of planning documents, terrain models, renderings, animations or – like here on Sketchfab – freely rotatable 3D models for archiving and of course for scientific evaluation and publication. Over the years, we have largely taught ourselves the skills and knowledge required. Forums, YouTube tutorials and the online community in general have of course all been a great help and inspiration. However, the goal of our new presence here on Sketchfab is not to show off perfect models with elaborately optimized geometry and imposing settings, but rather to provide an overview of specific measurements, work results and documentation (usually with drastically reduced polygon counts) obtained during the course of our daily work. Our collection “Burgen, Schlösser, Klöster” (Fortresses, Castles, Monasteries) also contains rapidly calculated yet nonetheless interesting small models that were created so to speak as by-products of aerial archaeological surveys. The history of 3D documentation at the State Office for Monumental Preservation began in 2010 with the acquisition of our first terrestrial laser scanner (Riegl VZ 400). This scanner was our most important measuring device for many years and was mainly used to measure items such as remnants of walls found during excavations (Roman temple to Apollo Grannus in Neuenstadt a. Kocher), ramparts, trenches and similar as well as entire monuments such as the caves in the Lonetal and Achtal valleys, which are now a World Heritage Site. In 2011, we also acquired a very good structured light scanner, the Polygon PT1660c, which we still use today, particularly for scanning archaeological objects or more complex finds such as graves. The image below shows a scan of a stove tile model (left), the positive of the tile created with a PC (centre), and the reconstruction of the finished stove tile using the original colours (right). Later on, we acquired a Surphaser SHX 25, an exceptionally precise terrestrial laser scanner for close-ups, and an Artec EVA. It was not until last year that we were able to complete our range of scanning equipment with a GeoSLAM ZEB Revo. Although this equipment is essentially very good, the last few years have seen photogrammetry prevail in almost everything relating to 3D documentation at the State Office for Monumental Preservation. Frequently employed in combination with drones, photogrammetry is used to measure plans and structures at almost all of our excavations. The great precision of photogrammetry with its tremendous recording speed on site and not least the exceptionally good photo textures means that it has almost completely superseded laser scanning and to a large extent also structured light scanning in our work processes. The one significant exception is mobile laser scanning with the mobile mapping system ZEB Revo, which we mainly use for the fast, large-scale mapping of caves (image below: survey of the “Friedrichshöhle” cave on the Upper Danube using the ZEB Revo) and historic mines (Point Cloud of the Mine “Himmlisch Heer”), for example. We also use an industrial computer tomography scanner, particularly for block excavations and objects with interesting interior structures and designs. This can deliver very good results even in the case of objects with extreme undercuts where normal scanners and even photogrammetry are of little use. For photogrammetric scans, we currently use Sony alpha 7RII cameras and Zeiss lenses with fixed focal lengths. These cameras take very sharp pictures besides being powerful and significantly lighter than SLR cameras, a factor that should not be underestimated when you are taking up to 7000 pictures a day. When documenting objects on the ground or raising the camera a few meters, we prefer to use a carbon photomast and take serial images at intervals of 2 seconds. If we have to go higher or document large-scale structures, we can choose from various drone systems (DJI Phantom 2, 3 and 4, DJI Inspire etc.) or a Cessna 172. We routinely use Agisoft Photoscan for post-processing the measurements taken daily at the excavations carried out by the State Office for Monumental Preservation. For projects such as scanning the World Heritage Site, we also use Reality Capture, with which we can realize exceptionally large, complex projects in reasonable time with excellent results. Naturally we also use a wide range of other software solutions such as Blender, Autodesk 3ds Max, Geomagic Wrap, Meshlab and Cloud Compare for special purposes and applications. One interesting project we have now been working on for several years is the documentation of the oldest known figurative art created by early humans (UNESCO World Heritage “Caves and Ice Age Art in the Swabian Jura”). This largely comprises figures of animals and human idols carved out of mammoth ivory. These objects were recovered from cultural layers in caves in the Swabian Jura and included the earliest known musical instruments, flutes made of bird bones. These unique testimonies to the cultural history of humankind were created during the last Ice Age, 43,000 to 35,000 years ago, by humans like modern homo sapiens. In 2017, after years of preparation, six caves in the Lonetal and Achtal valleys in which these unusual artefacts had been found were declared a UNESCO World Heritage Site. We began measuring the caves using terrestrial laser scanning back in 2012, a task which in some cases took several days despite the relatively small size of the caves (TLS from 2013 of Hohle Fels Cave), as up to 80 different scan positions were necessary to obtain the most complete point cloud possible of the caves’ interiors. Starting in 2014, we turned our attention to the ivory carvings, which are now on display in five different museums in Baden-Württemberg. Our aim was to document them in the form of highly precise models with photorealistic textures and present them on the internet. Here we used photogrammetry for the actual models and the structured light scanner solely for scaling. As these unique objects are often important museum exhibits but are also very fragile, there was no question of them being transported to us at the State Office for Monumental Preservation in Esslingen, and we had to find a mobile solution to record them in 3D. The fragility of these items naturally also makes handling them more difficult. This means they cannot always be optimally positioned in front of the scanner or camera for measuring (image below: the horse from the Vogelherd cave in an improvised mount). Because of its properties, documenting the approximately 40,000-year-old mammoth ivory is a constant challenge. The preserved surfaces are often polished, which means they have bright spots and reflect light. Some areas are also transparent, making it more difficult to record the data and in some cases causing artefacts in the surface geometries. For these reasons, we initially tested fossilized Siberian mammoth ivory and walrus ivory of recent origin for the purpose of developing suitable documentation strategies. First, we decided to use two different 3D imaging processes. Precise absolute measurements of the object’s geometry were guaranteed by using a structured light scanner. In the case of the Venus of Hohle Fels, the 154 individual scans yielded somewhat more than 6.4 million measurement points on the surface of the object, which only measures 59.7 x 34.6 x 31.3 mm. For the second 3D documentation procedure, we decided on the photogrammetric SFM process. Along with the artefact’s form, this process also documents the colour information on the surface of the artefact in high resolution. This facilitates photorealistic reproduction of the object. Reflections and shine are filtered out of the object’s surface by using cross polarized lighting (CPL). Based on several series of photos with polarized and unpolarized light, we are now also creating so-called specularity maps which enable us to portray the objects even more realistically. Over the last year, we have again turned our attention to the caves. 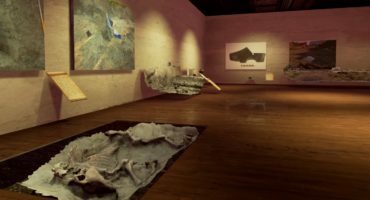 One idea we had was to develop a VR app which would allow users to enter the caves, obtain information about the locations where the artefacts were found, and hold reproductions of the objects “in their hands”. It quickly turned out that the colourless laser scans were not able to generate good immersion. We then decided to measure the caves once more using photogrammetric techniques so that we could again obtain photorealistic textures for the models. Despite the poor lighting inside the caves, the complex interior structures and the generally difficult working conditions, it proved to be possible to scan the caves very efficiently. Depending on their size and complexity, between 1900 and over 8000 images were made, a task which two people were able to accomplish in just a few hours in each case. The models created, the mammoth ivory artefacts and the “old” laser scans all appear in our collection “Ice age Art”. For performance reasons, these have of course been significantly reduced and by no means reflect the resolution of the original models. 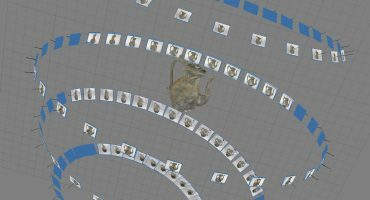 The VR app is now also making progress, and we hope to make the models accessible to interested users later this year on Ice Age Art. The 3D documentation of structures and objects has now become an indispensable part of archaeological monument preservation. In its early days, it was a highly complex and very expensive “special treatment” reserved solely for certain objects, yet modern scanning techniques are now part of the standard repertoire we use in our excavations and for restoration purposes. The models are naturally also valuable for purposes of scientific evaluation. It never used to be possible to make unique, fragile artefacts available to fellow professionals and interested laypersons worldwide, or to view even small objects like these Ice Age figures easily from all sides, without touching them, without blurring because of a shallow depth of field on magnification, and with or without texture. 3D printing for fast reproduction, e.g., of replicas and reconstructions or as an opportunity for visually disabled people to be able to touch the artefacts, is expanding the uses of 3D modelling in archaeology even further.